In a "Sound Bath," therapeutic sound frequency is both heard and felt, enveloping participants in restorative calm. No need for a swimsuit, the "bath" refers to the myriad of tones offered by various sound therapy instruments, including quartz crystal and Tibetan singing bowls, tuning-forks, and chimes. Non-invasive, sound vibration helps induce restful brain-wave state and gentle re-balancing of the nervous system. Participants are often able to enjoy the benefits of a meditative state, without effort. Sound therapy is often helpful for those who struggle with nervous stress, sleep and focus issues, resulting in its' growing popularity. Results are unique to each participant, and can vary from invigorated focus to tranquil relaxation. Feel free to bring a blanket, and wear comfortable clothing. Lay back on your mat and enjoy. Sound Therapy is an effective tool in reducing stress and anxiety, while enhancing brain and neurological function. A sound "bath" refers to an event in which a sound therapist offers frequency to participants, who recline in a comfortable pose to receive. Sound baths offer participants a unique opportunity to achieve a restorative, yet invigorated state, within several minutes to an hour. Sound frequencies are proven to induce restorative Alpha and Theta brain waves, and balance the parasympathetic nervous system, reducing nervous stress. Sound is effective in relieving adrenal fatigue, has been known to alleviate depression, and is becoming increasingly popular in medical applications. Because sound vibration is felt, as well as heard, sound is an impactful means of emotional and physical therapy. Quartz crystal "singing" bowls are effective in providing clear, exacted, and tangible frequency. Gong frequency is effective in producing dynamic, room and body-shifting wave. Other tools include symphonic tuning forks, Tibetan singing bowls, chimes, and drums. Sound baths continue to grow in popularity, due to their effective, immediate results. After experiencing the transformative effects of sound in a yoga class with Jamie Ford Bechtold in 2012, I sought out her events around Los Angeles and Joshua Tree, CA., growing more curious; I was experiencing dynamic and varied effects, and wanted to learn more. After studying privately with Jamie at the Sound Bath Center, I became inspired to share this effective science with others. Acquiring my first singing bowl, I began by integrating sound into the relaxation segments of my group dance and yoga classes, and in my work with Seniors. Soon, the requests grew to have events that were "just sound." What others were experiencing fed my enthusiasm, and I continued to explore the practical applications of sound frequency. As my practice bloomed, so did my interest in acquiring tools every chance I got. My family of instruments became my treasured companions; they now travel wherever I do, and make friends far and wide. Kristen Huffman is a yoga instructor, dance fitness instructor, and sound bath provider known for her distinctively uplifting teaching style and use of movement as healing. With over ten years of experience teaching in both private and group settings, she is passionate about fostering safe and non-competitive environments for practices of all levels. Whether working with infants or the elderly, those movement-savvy, or not-so-much, she regularly incorporates meditation, movement, and sound into her offerings. 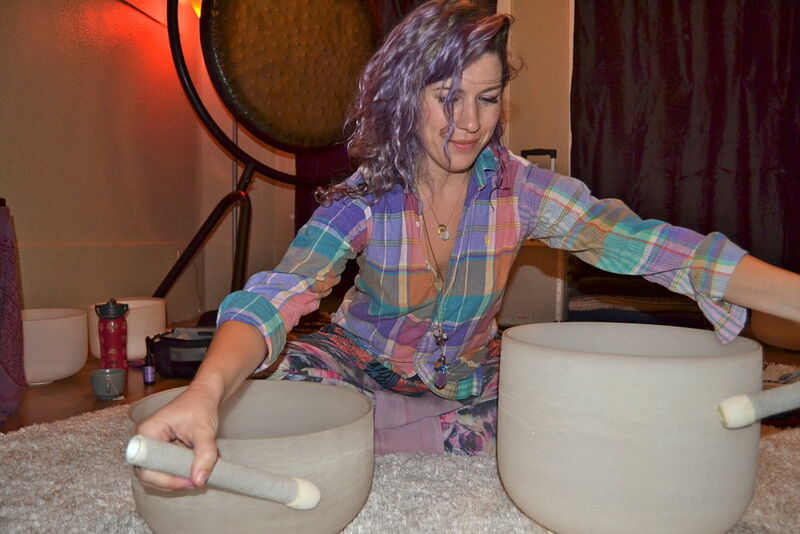 In addition to her classes in NYC, Kristen provides individual sound bath sessions, wellness workshops and retreats, and teacher trainings around the world.